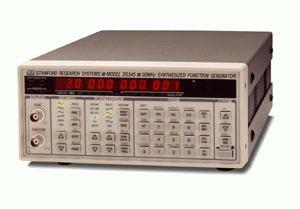 The DS345 Function /Arbitrary Waveform Generator is a full-featured, 30 MHz instrument that uses an innovative Direct Digital Synthesis (DDS) architecture. It generates many standard waveforms with excellent frequency resolution (1 µHz), and has versatile modulation capabilities including AM, FM, Burst, PM and frequency sweeps. It also generates arbitrary waveforms with a fast 40 Msample/s update rate.